During Rafa's Pre-tournament Presser the Spanish Media asked him a few questions & was posted as an article over at DiarioDeMallorca. The English one has yet to be released. So here is my translations with the help of google mangling. Your focus should be on the orange rectangle from the legendary Monte Carlo Country Club, living history of tennis, but Rafael Nadal is focused once again on the problems and doubts that generates from his knee. "I don't feel comfortable. I need more time, I need to play matches, I need to practice." said world number two in Monte Carlo, where this week he seeks his eighth title. It's because of that knee, Nadal withdrew in the Miami semifinals against Andy Murray, also because of the joint issues that caused him to be fifteen days without any training. Growth factors were injected into his knee, a treatment that aims to accelerate tissue regeneration after injury. It's not the first time he did that, so he knows the pain these injections generate. That didn't prevent him from being in a good mood yesterday, although always with an underlying seriousness and some concerns. It happened when a smartphone rang from a lady journalist, while serving as a recorder, laying on top of the table at which Nadal was sitting and talking. "It seems these are your kids", said the player from Manacor to the Swiss journalist while she was reaching for her phone with a picture of the little ones. But during the brief break and the smiles, the attention turned to his knee, which he is clearly concerned facing the debut tomorrow at the Monte-Carlo clay. The opponent will be Jarkko Nieminen, who won yesterday's Czech Radek Stepanek 6-3, 7-6 (7-3). "After Miami I stopped for a long time, I've started to practice four days ago. It's not enough after stopping for fifteen days. But I couldn't move my knee. I tried to be patient and wait for the right feelings, right attitude." "What I have is a bit of a tendon partly damaged, at the insertion of the quadriceps tendon. The fat tissue under the tendon gets inflamed and the whole area becomes very hard, I couldn't move my knee well," described the six-time Roland Garros champion. 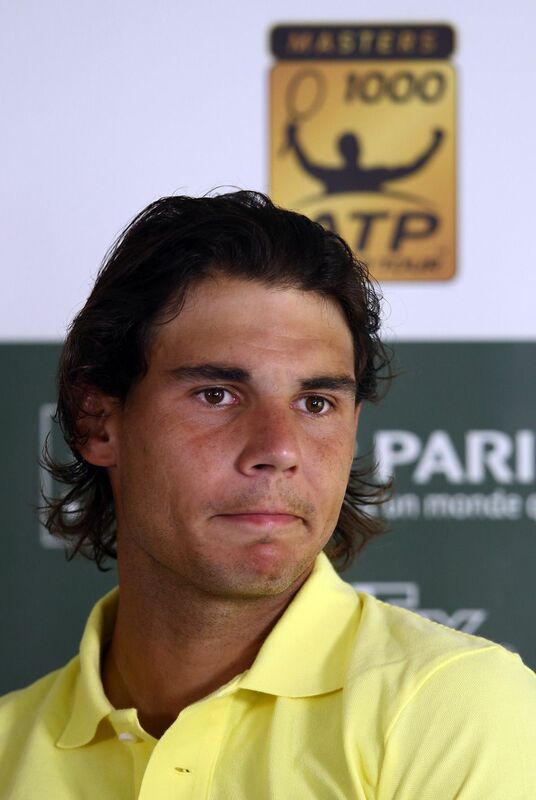 Although dismissing feeling pressure, Nadal admitted that when faced at the start of the season on clay, historically the most favorable to him, is not indifferent. "I do have fears, because this is the beginning of a part of the season very important for me, admitted the 25 year old. I had less time to train, that's true, he said before turning to refer to his knee, If it is OK, let's see how I feel when playing at the highest level, when the maximum effort is required." "I have been missing this question", he said smiling when they reminded him there have been ten months without titles, since June 2011 at Roland Garros. "It's true, I didn't win titles, but I played many finals. Win or lose depends a lot on your calendar, and in recent times I have played the biggest tournaments against the best."